GUYS. it was national pizza day a few days ago so in honor of that...here's a post about pizza!! also i just had to write about this place because it is so cool! it is like no other and it will change your life. a friend of mine from school mentioned he worked at "pizza studio" downtown and i was curious. 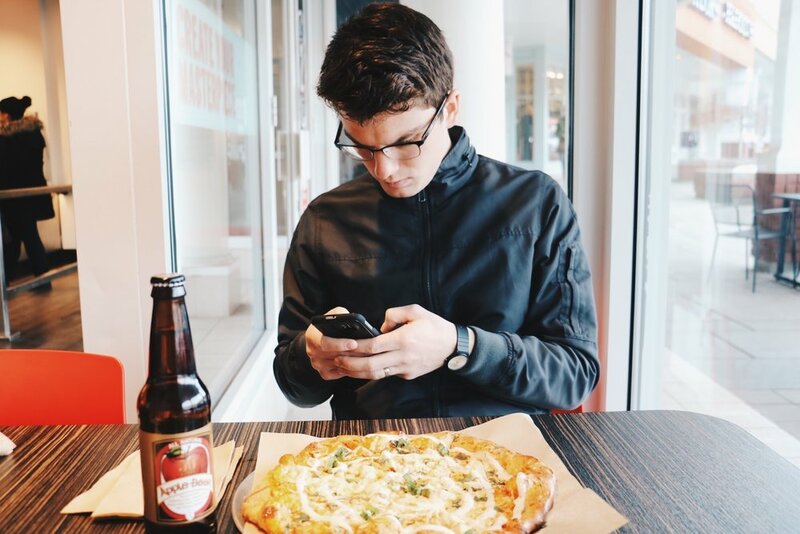 aaron and i love pizza and we love trying new places so i texted aaron, "pizza date?" it's the cutest little place! imagine subway...but for pizzas. the whole experience is fresh and new, you can create any style pizza you want and they make it right in front of you! you begin by choosing from a variety of crusts (my personal fav? rosemary) then continue down the line by putting different sauces, cheeses, toppings, and spices. the pizza is thin crusted and original because...well, you make it! you definitely leave feeling good and wanting more, the possibilities are endless. what i also learned it that the artwork hanging up in each studio is locally made which brings a unique, hometown feel to it. aaaaand their moto is "ingredients we trust" haha. clever ;) so i think you locals should definitely give it a try, you won't regret the taste or experience from this cute little pizza cafe.